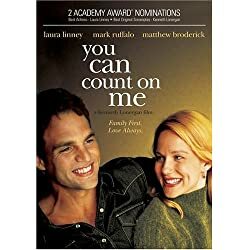 You Can Count on Me (2000) starring Mark Ruffalo and Laura Linney was a moving movie that everyone should see! Ok, maybe not everyone, but people who like movies about relationships. It was a moving portrayal of a brother and sister, and not the most functional brother and sister. She appears to have it all together – or to want to have it all together – and he appears every now and then, when he needs something. When he arrives this time, he needs even more than he realizes and ends up staying for a while. I love the performances. I laughed with them. I cried with them. I wished them the best of everything.